Frank Hardement was born in Norwich, Norfolk, in 1899. He was the son of bank manager Robert William Hardement (1859-1925) and Alice Elizabeth née Palmer (1862-1922). In the 1901 census Robert and Alice were listed in Norwich with their children; Charles E (b1888), Harold P (b1890), Dorothy (b1898) and Frank. Robert gave his occupation as a banker's clerk. Shortly after this Robert moved his family to Yeovil when he became manager of the Capital and Counties Bank on the corner of High Street and Princes Street. The family lived in the accommodation above the bank together with a cook and a housemaid. Frank attended the County School in Kingston and, later, worked in the Surveyor's Department of Yeovil Rural District Council. Frank enlisted at Yeovil in April 1917 when he turned 18. He became a Private in 'D' Company, 6th Battalion, Dorset Regiment. His Service Number was 34134. The 6th Battalion was raised on 6th September 1914 at Dorchester, forming part of the 17th Northern Division, whose battalions – mainly from northern regiments – undertook their training in and around the hills, heaths, and pine woods surrounding Bovington. Originally earmarked as Pioneers, the 6th Dorsets expressed a wish to be a fighting unit and the 7th York & Lancasters assumed the pioneer role. Although initially the Division had been selected for Home Defence duties, this decision was reversed and they proceeded to France, landing at Boulogne on 14 July 1915, concentrating near St Omer. They moved into the Southern Ypres salient and, after their initial trench familiarization, went into the line in that area. In the spring of 1916 they saw action at the Bluff, south east of Ypres on the Comines Canal, before moving south to the Somme. Here they fought in the Battle of Albert, in which the Division captured Fricourt, and in the battle at Delville Wood. In 1917 they moved to Arras and saw action in The First and Second Battles of the Scarpe and The Capture of Roeux. In late summer they returned to Flanders and fought in the First and Second Battles of Passchendaele. It is most likely that Frank Hardement was involved in these battles. The 6th Dorsets next took part in the Battle of Amiens, 8 to 11 August 1918. The Battle of Amiens, also known as the Third Battle of Picardy, was the opening phase of the Allied offensive later known as the Hundred Days Offensive that ultimately led to the end of the First World War. Allied forces advanced over 7 miles (11 kilometres) on the first day, one of the greatest advances of the war. The battle is also notable for its effects on both sides' morale and the large number of surrendering German forces. This led Erich Ludendorff to describe the first day of the battle as "the black day of the German Army". Amiens was one of the first major battles involving armoured warfare and marked the end of trench warfare on the Western Front. Within two weeks Frank was in action again, taking part in the Third Battle of Albert (21-23 August 1918). This battle was significant in that it was the opening push that would lead to the Second Battle of the Somme. This attack opened the advance, with the main attack being launched by the Third Army along with support from the Fourth Army. The attacks developed into an advance, which pushed the German 2nd Army back along a 50-mile (80 km) front line. On 22 August, the 18th (Eastern) Division took Albert, with the British and Americans advancing on Arras. Within a couple of weeks Frank's battalion was in action again. The Battle of Havrincourt was fought on 12 September 1918, involving the British Third Army against German troops, in the town of Havrincourt, France. Although the battle was relatively small, it marked the first time that the Hindenberg Line was pierced. This was the beginning of a turning point in the war, it was noted how the Germans had given up their position relatively easily. It highlighted the lack of fighting spirit amongst the German army at this stage in the war. The Battle of Épehy was fought on 18 September 1918, involving the British Fourth Army against German outpost positions in front of the Hindenburg Line. The village of Épehy was captured on 18 September by the 12th (Eastern) Division. Very few tanks could be provided for the attack, so artillery had to be relied upon to prepare the way but in the interests of surprise they did not provide a preliminary bombardment. Instead, the 1,488 guns fired concentration shots at zero hour and supported the infantry with a creeping barrage and 300 machine-guns were also made available. A couple of weeks later and the 6th Battalion was in action yet again in the Battle of Cambrai. Also known as the Second Battle of Cambrai, this was a battle between troops of the British First, Third and Fourth Armies and German Empire forces during the continuing Hundred Days Offensive. The battle took place in and around the French city of Cambrai, between 8 and 10 October 1918. The battle incorporated many of the newer tactics of 1918, in particular tanks. The attack was an overwhelming success with light casualties in an extremely short amount of time. Frank Hardement was killed in action on the final day of the Battle of Cambrai, 10 October 1918. He was just 19 years old. The Western Gazette in its edition of 25 October 1918 reported "Mr RW Hardement of the Capital and Counties Bank, and Mrs Hardement, have received information this week that their youngest son, Private Frank Hardement of the Dorsets, has been wounded and also that he is missing from his Battalion. 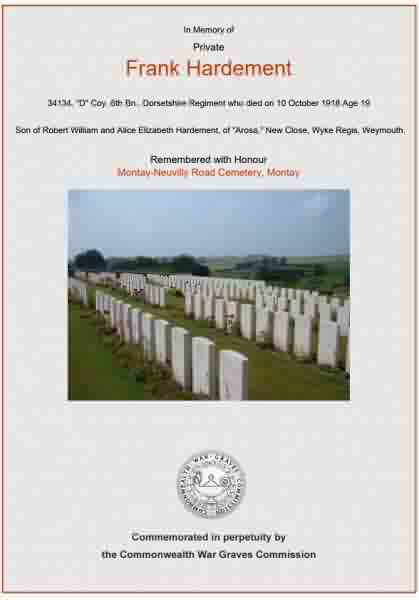 An old boy of the County School, Private Hardement was with Mr L Caplen, the surveyor to the Rural District Council, when he joined up in April last year." Frank Hardement was interred in Montay-Neuvilly Road Cemetery - Grave II.E.22 - and his name is recorded on the War Memorial in the Borough. 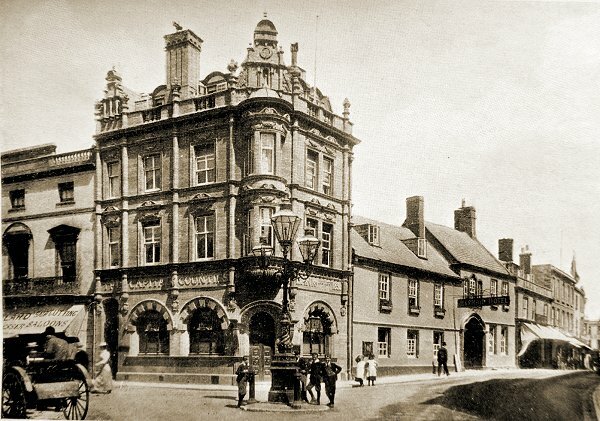 The Capital & Counties Bank on the corner of High Street and Princes Street, photographed in 1906. At this time Frank's father, Robert Hardeman, was the manager of the bank and his family, including Frank, lived in the accommodation on the upper floors. 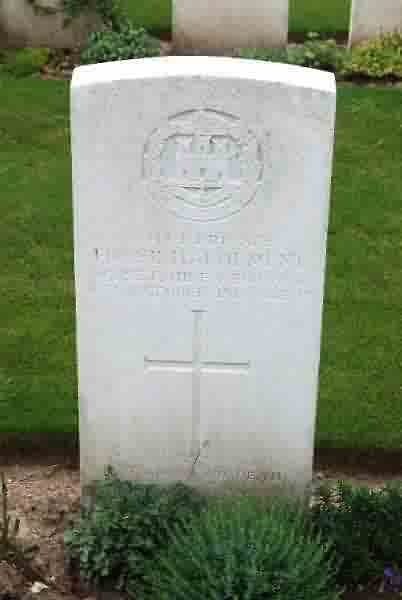 The Commonwealth War Graves Commission headstone for Frank Hardement. The Commonwealth War Graves Commission certificate in memory of Frank Hardement.